Chesapeake Energy is a good example. The second largest natural gas producer in the US, after Exxon, reported its debacle yesterday. 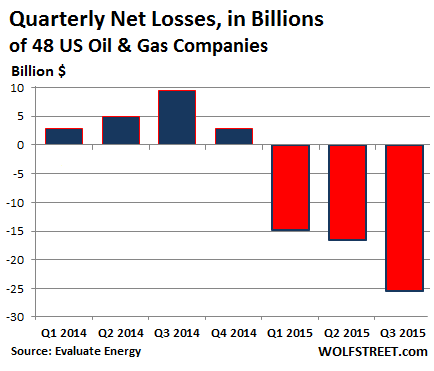 Revenues plunged 49% from the quarter a year ago, when the oil bust had already set in. The company has been slashing costs and capital expenditures. In June, it eliminated its dividend. And yesterday, it recognized $5.4 billion in impairment charges, bringing impairments for the nine months to a staggering $15.4 billion. Impairment charges are a sudden accounting recognition of accumulated capital destruction. These impairments pushed its losses from operations to $5.4 billion in Q3 and to $16 billion for the nine months. Chesapeake currently gets 72% of its production from natural gas, 17% from oil, and 11% from natural gas liquids. The oil bust has been going on since the summer of 2014. 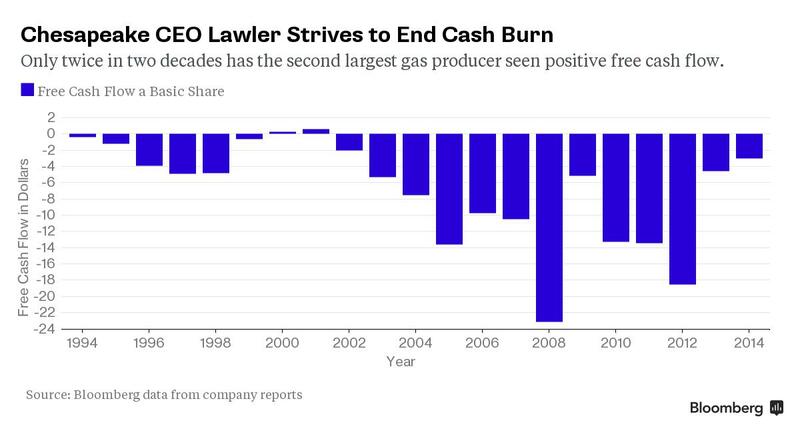 The US natural gas bust has been going on since 2009! Two natural gas producers have already gone bankrupt this year: Quicksilver Resources and Samson Resources. Its annual free cash flow has been negative since 1994, even during good times, with only two tiny exceptions (Bloomberg chart). After living off borrowed money, it’s now trying to hang on by selling assets and lowering its mountain of debt. But it still owes $16 billion, much of which QE-besotted, ZIRP-blinded, yield-hungry investors had handed it over the years, based on hype and false hopes. Its shares last traded at $7.50, down 75% from peak hype in June 2014. Its 4.875% notes due 2022 and its 5.75% notes due 2023, according to S&P Capital IQ LCD yesterday, traded for 66 cents on the dollar. In terms of capital destruction, Chesapeake is in good company, and not even the leader. A new report by Evaluate Energy, which covers Oil & Gas companies around the globe, examined the financial statements of the 48 US oil & gas companies that have reported earnings for the third quarter so far. The amounts and the speed of deterioration are just stunning. Turns out, what started in Q4 last year is getting worse relentlessly. And now it’s getting serious: plunging revenues, squeezed operating margins, whopping impairment charges, and horrendous losses are combining into a very toxic mix. Evaluate Energy determined that net income of those 48 companies was a gigantic loss for the three quarters combined of $57 billion. The biggest factor in these losses, as in Chesapeake’s case, was the impairments. For this study, Evaluate Energy only counted impairments of property and equipment, not of financial assets such as “goodwill.” Including charge-offs of goodwill, it would have been even worse (an example is Whiting Petroleum, which we’ll get to in a moment). Of the 48 companies, 38 recognized impairment charges totaling $32.8 billion in Q3 alone, a 79% jump from Q2, when impairments hit $18.4 billion. Since Q4 2014, these 48 companies recognized impairments of $84.6 billion; 39% of that in Q3. Devon Energy was king of the hill, with $5.9 billion in impairments in Q3, after having recognized impairments every quarter this year, for a total of about $15.5 billion. Our natural-gas hero Chesapeake is in second place, if only barely, with $5.4 billion in impairments this quarter, and $15.5 billion for the nine months. Of note, Occidental Petroleum, with impairments of $3.3 billion in Q3, Murphy Oil, Whiting Petroleum, and Carrizo Oil & Gas all recognized over 90% of their respective impairments this year in this misbegotten third quarter. They were in no hurry to grant their investors a peek at reality. However, Whiting’s impairments of $1.7 billion do not include an additional $870 million in write-offs of goodwill in connection with its once highly ballyhooed acquisition of Kodiak Oil & Gas, which closed in December last year. In Q4 2014, many investors thought the oil bust was a blip, that this was just a correction of sorts in oil prices and that they’d rebound in early 2015. But in 2015, oil and natural gas both have plunged to new cycle lows. And yet, over and over again, sharp sucker rallies gave rise to hopes that it would all be over pronto, that the price would settle safely above $80 a barrel, or at least above $65 a barrel, where some of the oil companies could survive. But now that oil in storage is practically coming out of our ears, globally, the meme has become “lower for longer,” and the game has boiled down to who can slash operating costs and capital expenditures fast enough without losing too much production, who has enough cash to burn through while this lasts, and who can still get new money at survivable rates. And that game is accompanied, as in Q3, by the giant sucking sound of capital destruction. Banks, when reporting earnings, are saying a few choice things about their oil & gas loans, which boil down to this: it’s bloody out there, but we made our money and rolled off the risks to others in a trade that has become blood-soaked. Read… Who on Wall Street is Now Eating the Oil & Gas Losses? They’re all “pumping” – until the money runs out. That’s the only option they have. They can’t just start selling books for a living. They’ve been doing this for years in natgas, eating up cash while pumping, and trying to tell investors that they’re making money when they weren’t. But now the new money is getting scarce and the old money is running out for many of them. Wolf, did you see the articles on Maersk cutting jobs and and other cost cutting measures? Not completely off topic, since their tanker fleet is included. Yes … the S is starting to hit the fan even among the biggest container carriers. All these mega ships that were ordered over the past couple of years … they’re coming. They can’t be stopped (Maersk only cancelled some options for more). They’ve been financed with borrowed money. As you pointed out, capital destruction is inevitable after a period of oversupply or overcapacity. Once you have explored, drilled, and fracked the hole your marginal cost to continue production is quite low. So it makes sense to keep the well producing as long as possible and use the cash flow to keep the creditors who put up the drilling and exploration capital at bay. Drilling a new well—- not so much! New drilling only makes sense if your exploration has identified a sweet spot in the field that is a slam dunk. Combine this picture with the accelerated depletion rates of fracked wells, and you have a time bomb whose clock is already ticking and cannot be stopped. Brilliant move on the part of Obama and the Saudis– using oil price collapse as a weapon against Russia without considering how it might destroy the future of US/Canadian oil production. So that’s not very bullish. Production, as I said in my other reply, is going to continue. It’s not going to stop. It’s far from slowing down on a year-over-year basis. And price pressures are going to mount in 2016. Long-term, shale production will go on, but prices must be higher or else all drillers go bankrupt. And if they go bankrupt, then prices will soar because drillers are too tangled up in bankruptcy court to drill much…. I believe the opposite. Looking at the mid-80s oil bust, the market (outside of Operation Desert Shield/Storm) didn’t hit the bottom until 93/94, and then briefly turned up later in 1995/96 only to really bottom out in 1999 before beginning the gradual rise in 2003. That was a 15 year peak to trough, with another 15 year trough to peak (1999-2014). Lots of externalities existed in this timeframe as well (SUVs, growth in suburbs/exurbs) and oil prices could barely rise until refinery capacity became tight mid last decade. Depending on how the end of direct oil powered personal transport plays out, I’m not sure that OPEC will ever again be able to control our ability to have low-cost oil based energy. There might be peaks in the oil industry but mothballed wells can be restarted, lots of geological maps have been created the last few years that can be tapped, and we should be able to be back at our previous levels of production in less than 18 months. My case is more on the bearish side, I fully expect to see oil in the 20s in the next 6 months. The shock and awe we’ve experienced to date won’t be anything compared to 6+ months of $25/barrel oil, which would likely force some industry reorg and consolidation, which should be bullish for the long term. Shale oil only works at high, most likely unsustainably high, crude prices. All the promised cost-cutting technologies are not going to be short term solutions to the high production costs. Possibly not long term either. Now that the schist has hit the fan, if any smarts are left in the potential investors, due diligence reservoir analyses will reveal the rapid production draw-downs exhibited by these wells. Maintaining production at attractive levels requires “Red Queen” type drilling activity, which, of course requires enormous cash investment. Will investors once again chase the delusion? I guess that depends on whose money they have access to and/or artificially low interest rates and manufactured liquidity. art berman likely wolf, clearly numbers and statics. 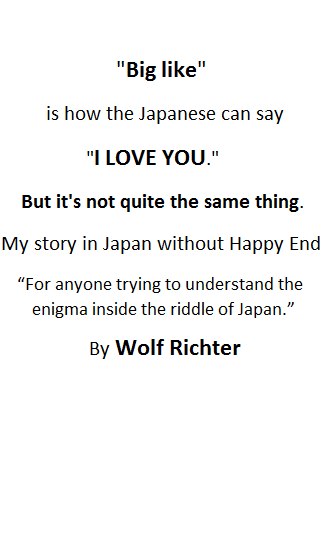 They are wonderful authors. shale oil is still expensive now, and maybe more if they have to face environment facts. Its time to kick Big Oil while they are down – and possibly prevent our own extinction. We are running out of time with rapid acidification of the oceans by CO2. It is happening too fast for life to evolve and adapt. Humans might be able to survive climate chaos – although it’s likely to result in massive stress from migrations and war – but if we kill invertebrate and vertebrate life in the oceans, it could doom the majority of humans. We need to stop this fossil fuel insanity – and here is our chance. Kick them while they are down – tax carbon out of existence. Alternatives exist and could be in place by 2030 if there was political will. Check out Stanford’s Mark Jacobson for solutions. Acidification of the oceans may be the least of our worries thanks to Fukushima. The lower levels of the food chain in the Pacific are already toast. from immediate needs like Fukushima. Fukushima is ongoing, continues to destroy daily, and has no end in sight. In short they have yet to invent the equipment that could properly respond. It is an impossible task at this time. Obviously all pollution is bad; nuclear is obviously the most immediate and most harmful. Fukushima is happening today and nothing is being done – chernobyl and fukushima have changed little ( the Germans got it correct though) . Here’s a gneiss thought for you….the surviving E&P companies ( i hate the term shale drillers, sounds like a scam, huh NT?) will be those with courage to shutin wells and layoff personnel to survive. There will be unhappy repercussions from this, of course: mineral owners lose income, states lose revenue, regulatory agencies lose funding, and the laid-off personnel may never return if the bust lasts too long. Gneiss. I like what you did there. You are correct. To survive and fight another day, E&Ps will have to pull in their horns. All the ramifications you mentioned will occur, as they have in past busts. I worked through a couple of those cycles and during the booms saw a lot of poor quality prospects drilled. Not to the magnitude of the shale oil plays of course. That is a whole other level of bad decisions. I think you mean “peek” in the following sentence, or is this just a really awful pun? They were in no hurry to grant their investors a peak at reality. It’s fixed. Thanks for pointing it out. Art Berman (who knows what he knows) sez only 1% of Bakken is remunerative @ today’s super low, low prices ($30/barrel). 1% … what does this mean? It means only the smallest fraction of the world’s oil plays are remunerative. It isn’t just shale plays, it isn’t just USA companies … absence of return besets the entire industry. Credit constrained customers = the petroleum industry as a whole is insolvent. Bigger ‘firms’ (such as Russia and Saudi Arabia) have some non-fuel reserves to burn though but not an infinite amount. Saudia will outlast Harold Hamm and Exxon but not for long. What’s broken is the economic model rather than how it’s deployed or adjusted. The ‘plan’ is to destroy resources so that some borrowed ‘funds’ will line the pockets of a handful of ‘rich’ men. Better to hang all the rich men at once … and keep the resources in the ground (and elsewhere) until someone comes up with a better use for them besides burning them up for nothing. Otherwise … what we see is what we get. I can only hope that this ‘disaster of mega proportions’ in oil and gas won’t be ‘solved’ by the same governmental methods as were used on the ‘airline crisis’ and the ‘automaker crisis’ in the past. Some of you are not thinking clearly, or at all. Whether you like it or not, this is the Petroleum Age. I challenge you to tell me of any product or service you use in your life 24/7 that is not created, derived, provided, or transported via petroleum or petrochemicals. Describe to me your life without fossil fuels: tell me how you will clothe, feed, and provide shelter for you and your family. Art Berman is legit. Check his next presentation scheduled for next Monday in Ft. Worth – it will not be well-received by the high-leveraged hustlers (hucksters?). The strategic oil reserve can be manipulated into playing a role here. As it drains into the market, like tight oil, it will take years to work its way through. In the meantime, the oil complex becomes catastrophically impaired.